A four-member team from Stanford University that created a film coating for electronic screens won a $200,000 grant and first prize yesterday in MIT’s third Clean Energy Entrepreneurship competition. Incorporated under the name C3Nano Inc., the team created thin film photovoltaic electrodes — the basic components of electronic screens for devices ranging from cellphones to solar panels — that are made of plastic instead of the usual glass. The plastic electrodes are cheap to make, more durable, and even more transparent than conventional electrodes. “It’s a much more robust film,’’ said Ajay Virkar, a C3Nano cofounder who graduates next week with a PhD from Stanford. The team, which beat 61 other teams from 34 schools, began as a project in the chemical engineering lab of Stanford associate professor Zhenan Bao. The event’s most lucrative prize is the chance nascent companies get to meet venture capitalists who could provide the funding they need, said Tom May, chief executive of NStar, the Boston utility that cosponsors the competition. 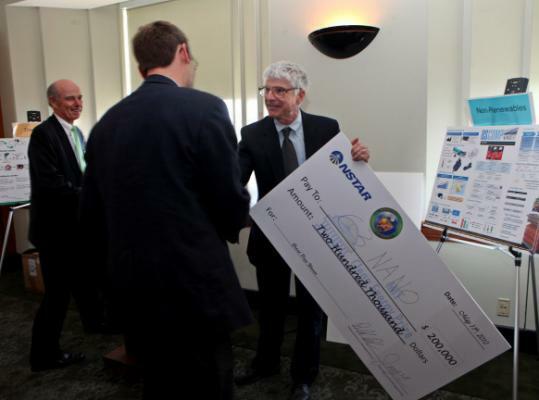 One notable clean energy company, FloDesign, a Wilbraham wind turbine manufacturer, was launched after winning first prize in 2008, May said. “When FloDesign won . . . they actually had venture capitalists following them out of the room wanting to offer them money,’’ he said. The technologies demonstrated among the competing teams this year, May said, may look like science fiction, but have every possibility of becoming reality. “It’s not an idea that changes the world. It’s a product that gets manufactured and used that changes the world,’’ May said. At the awards ceremony yesterday, C3Nano cofounder Melburne LeMieux said the company is looking for $2 million in venture financing to build and test prototypes, then an additional $4 million to produce a pilot line of products. Counting the Massachusetts Institute of Technology prize, the company has raised $266,000, but has yet to receive any venture funding. Last year’s winner, Husk Insulation of the University of Michigan, created refrigerator insulation from burned rice husk. In the final round of this year’s competition, C3Nano beat four teams: Harvard University’s C-Crete Technologies, which nano-engineered a stronger, environmentally friendlier concrete; Enertaq, from the University of Maryland, created a device that tracks electrical demands of large buildings and adjusts the supply accordingly; Oscomp Systems, with students from Harvard and MIT, invented a compression technology that reduces the cost of natural gas production; and viaCycle, from Georgia Institute of Technology, created a digital lock system for fleets of community bicycles. Erin Ailworth of the Globe staff contributed to this report.